The catechumenate consists of four stages: pre-catechumenate, catechumenate, purification and illumination, and mystagogy. Are we intentionally facilitating all four stages in our catechetical programs? Often, mystagogy is missing. We typically spend most of our time in sacramental preparation and weekly catechesis focused on activities that imitate the catechumenate or purification stages instead. We could think of many reasons for this. The actual participation in the sacraments occurs long before we get to teach our students. Their memories of the experience can be vague. 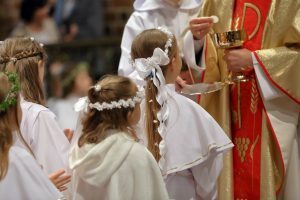 Even when they do remember experiencing a sacrament, even the Eucharist, it can be difficult to pull out of them any meaningful thoughts on the experience. 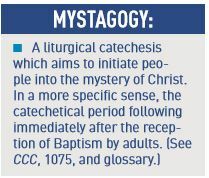 But if we think of mystagogy simply as a process by which we recognize an encounter with Christ through the sacraments, then we can focus our efforts on helping students see the sacraments in a new way. This might be an imperfect analogy, but we might think of mystagogy as a post-game press conference with a football coach. He answers questions about the game and gives an analysis of what happened, why, and what the team will do differently next week. Similarly, mystagogy can give students the opportunity to recount what happened, give reasons why things happened that way, and share what they will do in the future as a result. Here are a few ways to facilitate that post-game press conference for the sacraments. Like a good reporter at a press conference, ask questions that get the students to think deeply about their experience of the sacrament. Don’t teach yet. Let them share what they remember and recount the experience exactly as they remember it. The more you can help jog their memory, the better the mystagogical unpacking will be. Sometimes you need to give students tangible reminders of what they experienced during the liturgy — almost like a highlight reel of a football game. Students may start to recall things with a little reminder. Focus on just one symbol at a time and really unpack the way in which it expresses the change we experience in the sacrament. You might even give the students a concrete experience of the symbol so you have something to discuss and connect back to the actual experience of the sacrament. For the waters of Baptism, for instance, take your students on a trip to the bathroom. Require the students to wash their hands. You might even make a bowl of mud, have the students get their hands dirty, and then have them wash up. Afterward you can have them describe the experience of washing their hands. What did they see, say, and feel? You could do something similar for each of the other symbols of Baptism, Confirmation, and the Eucharist: candle, white garments, oil (Chrism), bread, and grape juice. Give the kids the opportunity to experience these symbols separate from the sacraments so you can give them a deeper appreciation of why they are part of the individual rites. The deeper the understanding of the symbols of the sacrament, the better connections the students will be able to make for themselves as you express the theology and effects of the sacrament. After the students have experienced the symbols separate from the sacraments, you can present the ways in which we are changed by the encounter with Christ in those unique ways. Then you can invite the students to make the connections for you by asking, “Why do you think this symbol helps us encounter Christ in this way?” You could make a simple matching worksheet for the students to complete when you are finished with the discussion. Just like a post-game press conference, the goal is to unpack what they’ve experienced so they can look. Ultimately mystagogy enables us to recognize the change occurring from an encounter with Christ so we can go out and live our lives more fully in the future. JARED DEES is the founder of TheReligionTeacher.com and the author of To Heal, Proclaim, and Teach: The Essential Guide to Ministry in Today’s Catholic Church.